When is a Blu-ray player not a Blu-ray player? When it's a Blu-ray transport – like the Denon DVD-2500BT. The nomenclature gives it away: this is a multi-purpose video disc-spinner, primarily Blu-ray and DVD, but its real strength lies in what it hasn't got. Namely onboard audio-processing, multiple AV outputs or high-end video tweakery. In fact, spin this beast around and all you will ﬁnd on the back panel is a solitary HDMI output, an RS232 port and a couple of multiroom jacks. I have never been one for minimalism, but Denon just might have an idea here. If you have an all-singing, all-dancing AV amp, receiver or processor with cutting-edge audio-decoding and fancy video scaling built-in, why pay to duplicate these features? So Denon has taken its purist BD player, the £1,700 DVD-3800BD, and thrown out all the non-essential features to offer the same core performance at a much lower price. As you still get the Denon Precision Drive Mechanism, separate block construction, multi-layer chassis and all of the core high-end hardware components, one can only view the DVD-2500BT's £900 price tag as a cinephile bargain. HDMI output is fully v1.3a compliant and you get 24Hz support as well. The menus use none-too-shoddy graphics, it handles DivX discs with ease and it has an SD-card slot on the front for JPEGs, MP3 or WMA ﬁles. On the downside there's no SACD or DVD-A playback or Denon-Link connection to reduce jitter in the audio data stream (and the HDMI format can have more jitters than a wino on a Sunday morning). It's Proﬁle 1.1, too, (Bonus View) and disc-loading and unloading is painfully slow compared to DVD. Just as well then that it produces simply breathtaking Blu-ray pictures. We are talking a jaw-dropping upgrade over basic players such as the PS3, with silky smooth scrolling, black levels from the depths of Hades and a range of colour tones that will stretch all but the very best high-end display devices. I was lucky enough to audition the very ﬁrst DVD-2500BT that arrived in the UK and within minutes of spinning the ﬁrst disc I knew I needed a major projector upgrade. 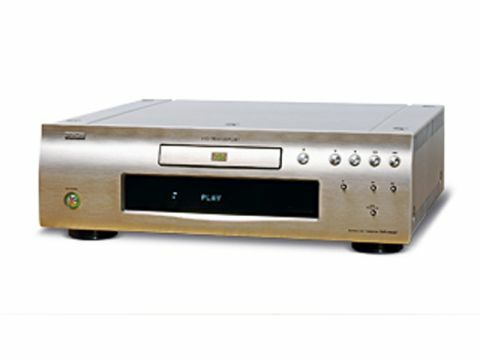 For a sub £1,000 price tag the Denon DVD-2500BT eclipses the video performance of any Denon source that has preceded it. Hook it up to decent 1080p plasma and the image is all but three-dimensional.